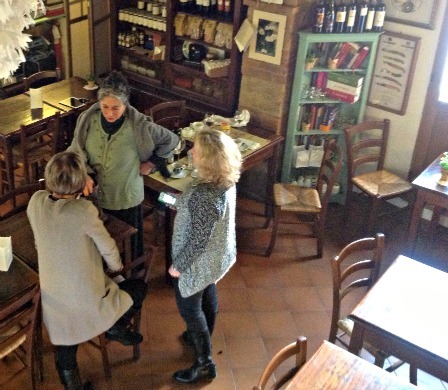 A word about etiquette for wine-and-olive-oil tourists in Italy, with everything from how to book a tour, what to expect on a tour, what to pay for the tour, and how much you should plan to buy (and possibly ship back). Pamela Sheldon Johns is the author of seventeen books primarily about the traditional and regional foods of Italy. Her recent work includes Silver Spoon Sicily (Phaidon), Cucina Povera, Tuscan Peasant Cooking (Andrews McMeel), and Gelato! (Random House). She is currently working on Silver Spoon Puglia. Since 1992, Pamela has led food and wine workshops in several regions of Italy which have been praised by Food & Wine magazine, Wall Street Journal, Cooking Light magazine, and CNN Travel. In 2001 Pamela and her family opened Poggio Etrusco, an organic agriturismo/cooking school in southern Tuscany which has been featured in Travel + Leisure magazine. Q: We’re independent travelers planning a trip to Italy and would like to visit a wine estate. What tips do you have for planning our visit? A: Most wineries now have websites that list information about visits and tastings. It is wise to reserve in advance to be sure that they will be open on the day you want, and available in your language. 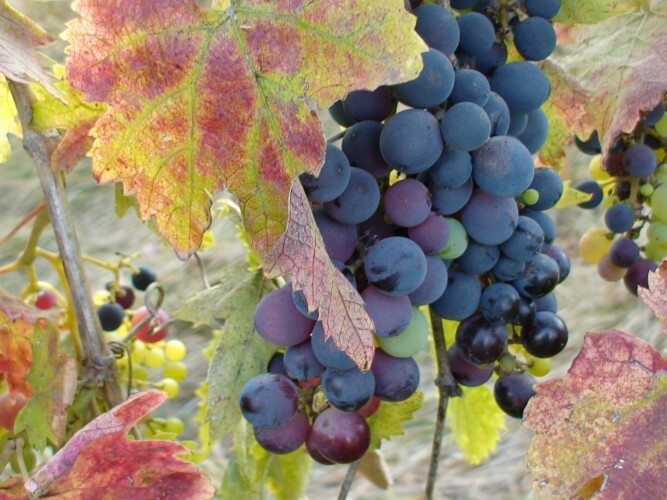 Most DOC and DOCG wines have an informational organization that will list the wineries. Google the name of the wine you are interested in and the word consortium (or consorzio in Italian), and you should be able to find some contact info. You will find that most wineries now have websites that list information about visits and tastings. The major wineries are very well organized. For the important wineries, it is wise to reserve in advance to be sure that they will be open on the day you want, and someone will be available to translate in your language. Q: Are there “admission fees”? Should we anticipate a certain fee? Are we expected to buy a number of bottles? A: This really varies from winery to winery, but nowadays, you can expect to pay a tasting fee, while the visits are often free. There is no obligation to buy. Q: Should we visit during the harvest? If not, what will we see at other times of the year? A: You may get more attention when the harvest not going on. Most personnel will be in the vineyards and the cantina at that time! Q: On our last trip when driving through Tuscany, we noticed hand painted signs advertising wine visits. Can we just drive up the driveway? Should we ask our hotel to call ahead? A: I would consider those signs an invitation, but if you don’t feel comfortable dropping in, note the name and location, and ask your hotel to set up a visit. Q: Are there any “don’ts”? We don’t want to be bad guests! A: Obviously, you don’t want to overdrink. Be mindful of the time allotted for your visit, as there may be other guests arriving for the next tour. Be mindful of the time and try to avoid visiting between noon and 3pm as the family and workers may be enjoying their lunch. Q: What are the DWI laws in Italy? Should we get a driver for the day? A: In recent years, the laws have become more strict, and should be considered for your own safety as well. A driver is a great solution, but you can also learn a lot about wine by swishing it in your mouth and spitting. Buy a bottle and enjoy it when you get back to your agriturismo or hotel. If you prefer not to worry about it, you may wish to consider a custom tour. Q: What will a typical tour include? Some wineries start in the vineyards and speak about agricultural practices, and most wineries include a walk through the process, from the area where grapes enter and are pressed, through the fermentation and barrel room, all the way to bottling and, finally, the tasting room. Q: May we ask the winery about olive oil? A: Of course! Most wine producers also have other products, and will have them available in the tasting room. On another day, we would like to visit an olive farm. Can you recommend favorites in Tuscany? Q: On our last trip when driving through Tuscany and Umbria, we noticed hand painted signs advertising olive oil. Can we just drive up the driveway? Should we ask our hotel to call ahead? A: The olives are usually pressed from mid-October through November or December, depending on the area and weather. It could be interesting to visit a frantoio (olive oil mill). When not working, some mills will let you see the equipment and do an olive oil tasting. One friend of mine in Chianciano Terme (SI) has a video in several languages that shows the entire process. Q: Will there be a fee? Or are we expected to make a purchase? 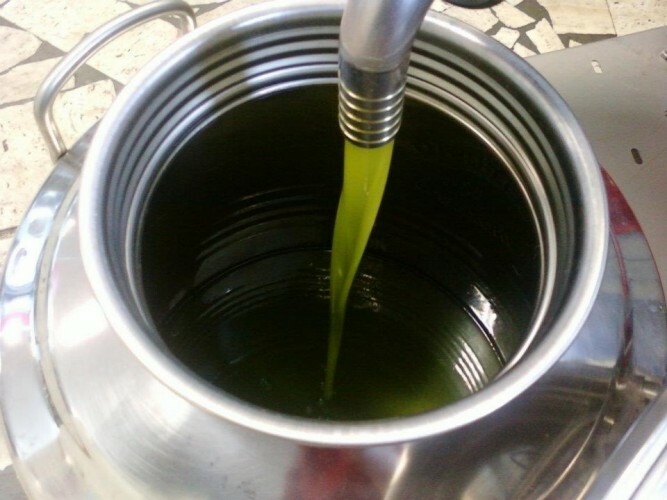 A: Every producer is different, but there isn’t usually a fee for a simple olive oil tasting. No one is obligated to buy. A: Bread is sometimes offered for an olive oil tasting. Q: How do we express our thanks to the host? Learn to say thank you in Italian. “Grazie” or “Grazie mille” will always be appreciated. 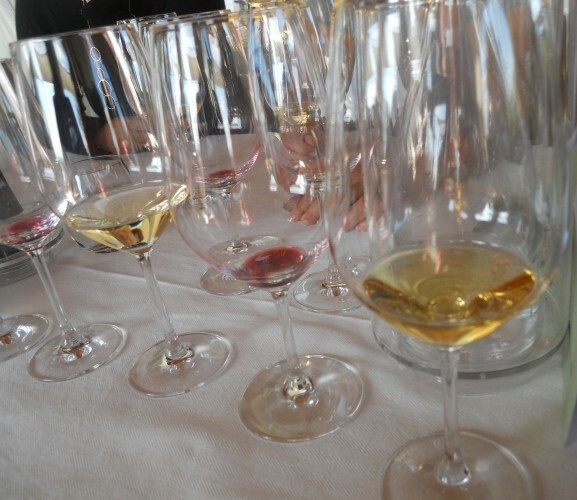 In an upcoming post we will “visit” wine producers and enotecas, so be sure to subscribe to this blog. We hope you enjoy your next trip to Italy. Please let us know of your favorite wine and olive oil visits, by sending a note to Olio2go’s Customer Service. Planning a trip to Tuscany? We’re thrilled to share this recommendation. 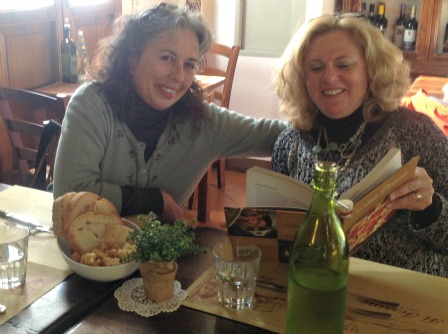 Following a late start and a long drive, we had the great fortune of enjoying lunch in Monticchiello di Pienza with Pamela Sheldon Johns at her good friend, Daria’s restaurant, Osteria La Porta. If Pamela’s name isn’t familiar to you (it should be! ), we carry her fine cookbooks, such as Cucina Povera, and her olive oil, Pace da Poggio Etrusco. We arrived toward the end of the lunch service and were charmed by the hospitality and excellent food. My craving for pasta with truffles, though not on the menu, was promptly addressed. Other gems included perfect duck, and a pasta ravioli with pumpkin. 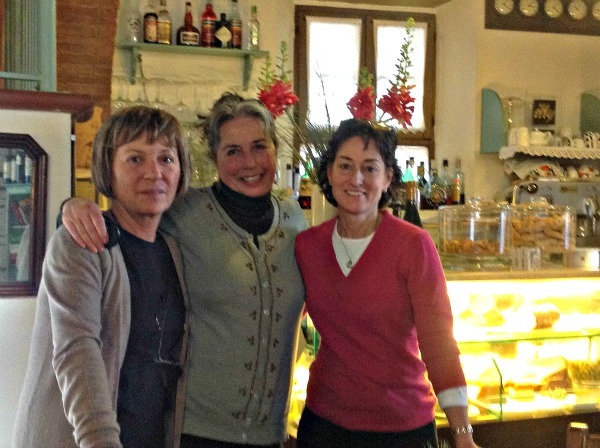 The restaurant was charming, the host welcoming, and the town was ever appealing with a view toward Pienza. 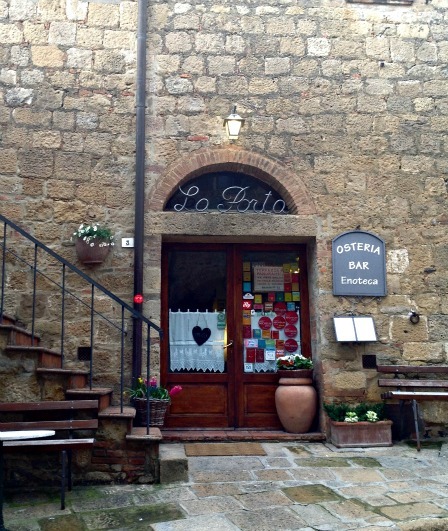 Certainly a day or two spent in the area of Pienza or Montepulciano, could only be enhanced by a visit to Osteria La Porta. Lunch in Tuscany was followed by dinner in Bologna. Don’t miss that upcoming post.